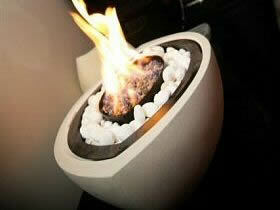 Gas Fire Bowl Fireplace, Fire Bowl Designs in Stone or Metal. This ICONIC design was created in 1999 and started the trend which has seen a number of “imitations” created. No air vent required with this fire. Winner of the Price of Wales Design Award the small oval gas fire bowl features burner technology which creates a sparkling undulating sea of blue incandescence to gentle peaks of yellow flames. The Small oval is 490mm Wide (tip to tip) and is available in White, Black or Sand Stone, or Hand Polished Aluminium or Stunning Bronze. This 490mm diameter piece with its unique, voracious and beautiful flame picture is perfect in larger rooms and is ideal for contemporary centre of room or fire table designs. The circular gas fire bowl is a elegant, timeless piece that can be showcased in a variety of ways and is always admired and appreciated. The flame which changes from a sea of undulating blue to peaks of yellow. Available in a choice of finishes and installation options. 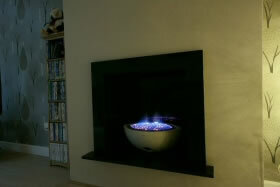 There is a bio-ethanol or flueless version of the small oval fire bowl available. 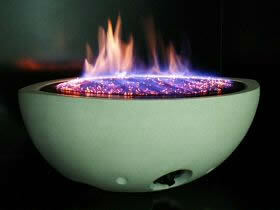 The gel fire bowl is 490mm (tip to tip) and has a stunning flame pattern. Both beautiful and practical, giving warmth and 3.6kw of heat. The Bowl is supplied on a plinth, is portable* and has a lid to extinguish the flame when required. There is a choice of 5 finishes and 2 ceramics. 10 versions to choose from. *the bowl must only be moved when not lit and must be allowed to cool down. This special range of high quality traditional fireplaces have been created to be used with any of the cvo gas fire range. With carved stone surrounds in materials like portuguese limestone or african black granite these fires are both glamorous and stunning. Choose from three standard designs using the CVO small oval gas fire bowl or request a bespoke design using any of our 30 CE approved gas burners. All of the CVO gas fire bowls are available to buy with a range of double sided or see through enclosures to create a stunning fireplace feature. Glass can be added to one side if required. Image : Bronze Fire bowl with “See Through” Polished Bronze Enclosure installed in the London Penthouse Apartment of a leading actress. We have a wide range of standard enclosures to match our gas fire bowls. Enclosures are available in many finishes from natural stone to black or brushed metal. There are single sided or double sided (see through) versions and the double sided version can be supplied with glass on one side. For specification sheets and prices please call our sales team on 01325-301020. 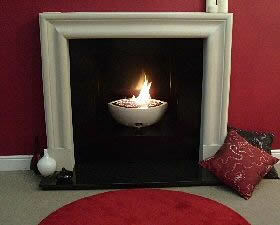 The image shows the small oval white fire bowl with an African black granite enclosure as installed in a customer home. Choose from standard fire table designs or we will create a bespoke fireplace to suit your requirements. CVO Fireplaces have been installed in commercial properties around the world by architects and designers who require a focal point that will have customers returning time after time. We can supply a wide range of gas burners, fire tables and canopy designs. Shown Left : 1.8M Round Table with White Stone, Seats, Circular Firebowl and Canopy – London Restaurant. Need a custom designed fireplace? We specialise in designing bespoke fireplaces for clients using our unique gas burner technology. We have over 30 unique gas burners available to choose from. 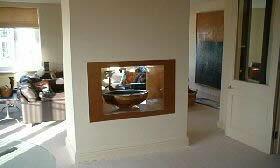 We are also available to design bespoke ethanol fires. To discuss your requirements please call 01325-301020 or fill in our online contact form. European Wide CE approval for Natural Gas, LPG & Propane – please ask. Standard and Double Sided enclosures available in either stone or metal finishes. Traditional, Central, Corner, Bespoke. NOTE: We can make a Bio-Ethanol version of any of our fire bowls upon request. 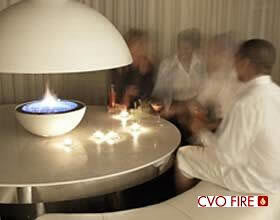 CVO FIRE created the gas fire bowl concept in 1999. All assembly work is done at our factory in the UK and bowls are manufactured to a very high quality and are very reliable. For example a gas fire bowl has been installed in the Epernay Bar in Birmingham since 2001, operating 7 days a week and this fire still looks as good today as the day it was installed. 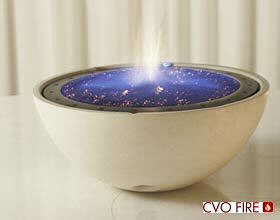 Our stone fire bowl, aluminium fire bowl and bronze fire bowl designs are made to an exceptional level of craftsmanship with a flame quality unique to CVO. Using Ceramat gas burner technology which creates an undulating sparkling sea of blue incandescence to gentle peaks of yellow flames. Winner of the Prince of Wales Design Award. Our Gas Fire Bowls are the choice of top architects and designers around the world who demand high quality, reliable products. Fire bowls can be seen in many top hotels, wine bars and restaurants but are widely used in homes as part of a traditional or contemporary fireplace. Installation options are unlimited so call us to discuss your plans in detail. You can also download our full brochure and price list direct from the web site. Designed to be admired, the clean burning flame of a gas fire bowl dances across the matting giving the appearance of embers burning in a coal fire. With a wide range of sizes and finishes these gas fire bowls are equally suited to a contemporary or traditional home. There are many installation opportunities with a gas fire bowl, in the wall, traditional style or on a table, please call us to discuss.